OAXACA, Mexico — In the introduction to her remarkable book High Static, Dead Lines, on “sonic spectres” and artifacts, curator Kristen Gallerneaux asserts: “Finding ways to allow our media to haunt us is crucial to understanding it.” Though Gallerneaux’s interest concerns unexplained audio phenomenology, she entertains the notion of “stone tape theory,” which suggests that historic events, trauma, and sounds can be subtly recorded within the physical matrix of stone architecture or natural materials, such as quartz crystals. Such new-agey concepts must be relegated to the realm of pseudoscience, but within the arts, they provide a philosophical underpinning to the intuitive sense that we impart life-energy upon our objects after we die. 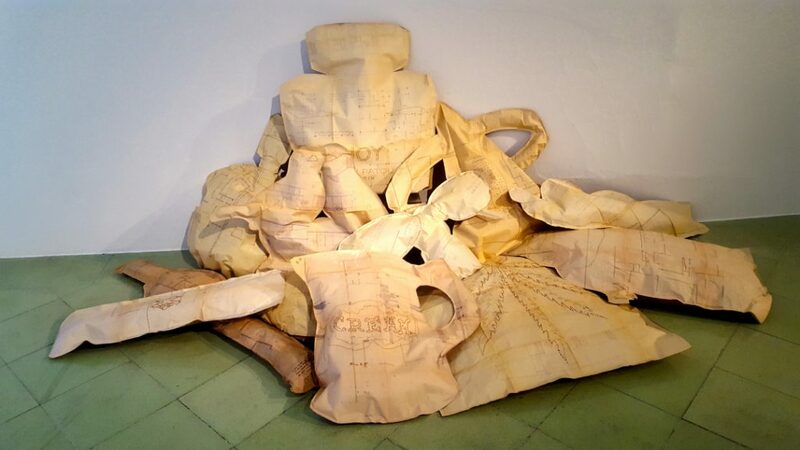 In a body of work by Emilia Sandoval, Buscas Aún, Nos Buscas Lugar (You Are Searching Still, Searching for a Place for Us), on display at the Museo Textil de Oaxaca, the artist grapples with the loss of her mother by creating ghostly echoes of her worldly possessions. Gallerneaux might argue that Sandoval does not, in fact, create these echoes, so much as sense and remake them as more visible to the physical world.